The DKN XC-150 is a cracking machine. It’s solid, silent and stacked full of features. The 20″ stride length provides one of the smoothest actions you will find from a machine in this price range. 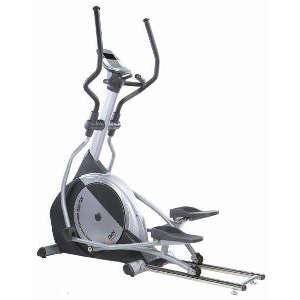 Along with the large 12kg flywheel this makes the DKN XC-150 a dependable and sturdy trainer that borders on gym quality. The electromagnetic resistance gives you 16 levels of resistance. Electromagnetic resistance is superior to the old fashioned magnetic resistance found on older, inferior machines in that it delivers constant, accurate and silent resistance. Because there are no moving parts in the resistance mechanism it also means that the lifetime of the machine is increased too. There are plenty of programmes to help you towards your goals. In total there are 20 professionally designed programmes, including 4 that make the most of the heart rate control functionality. To see how far on track you are there is also a heart rate recuperation test. After each workout you simply press the recovery button and hold onto the pulse grip sensors (or wear a compatible chest belt). After 60 seconds your recovery rate will be displayed on the screen. Your rate is graded from 1 to 6 – 1 being the fastest recovery, 6 the slowest. Should anything go wrong, the DKN XC-150 has a full 2 year on-site warranty to cover parts and labour. 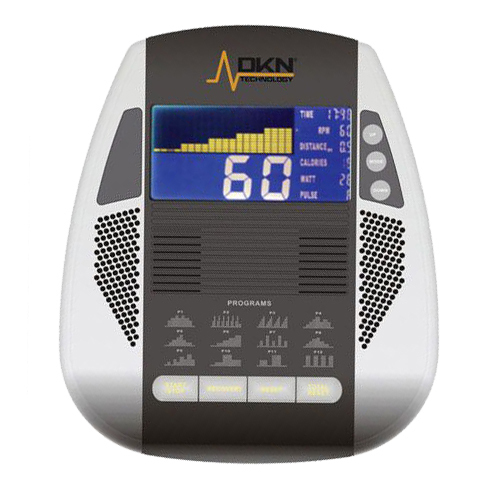 The DKN XC-150 is not currently available from any retailers we're aware of in the UK. We were very impressed with the build quality of the machine. Its certified to BS EN 957 class SA standard which to cut a long story short means that the DKN XC-150 is a semi commercial grade product. All your workout information is displayed on the ultra-modern LCD monitor. It clearly displays the speed/rpm, time elapsed, distance covered, (theoretical) calories burned as well as a scan of your heart rate and workout profile. The console itself is simple to use, with just 7 buttons in total. 3 on the side to select the mode and 4 at the bottom of the console to start/stop the workout, 1 to start the recovery programme, 1 to reset the workout and 1 to reset the whole machine. Other manufacturers should take note - this is how consoles should look. We want to give our muscles a workout, not our brains! Front loaded flywheel ensures a more natural leg position. Long stride length means it's not ideal for users under 5'6".